This chapter engages in evaluating existing regulation and industry practices of residential mortgage-backed security (RMBS) in Australia. This evaluation is made in order to identify the extent to which existing regulation may hinder or promote RMBS in Australia. As part of its dialogue, the first section of the chapter engages in summarising the discussion made from Chaps. 1, 2, 3, 4, 5, 6, and 7. The assessment of law begins by assessing the regulatory provisions pertaining to the mortgage origination process in an Australian context. 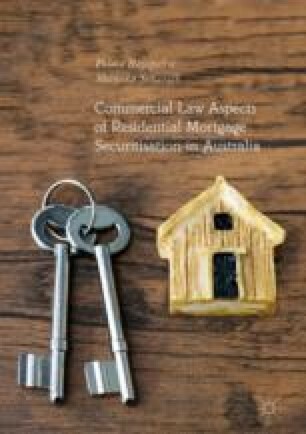 This chapter evaluates regulatory provisions pertaining to the transfer of mortgagee’s rights to the special purpose vehicle (SPV), issuance of RMBS by the SPV, and finally financial and insolvency risks pertaining to RMBS securities in Australia.